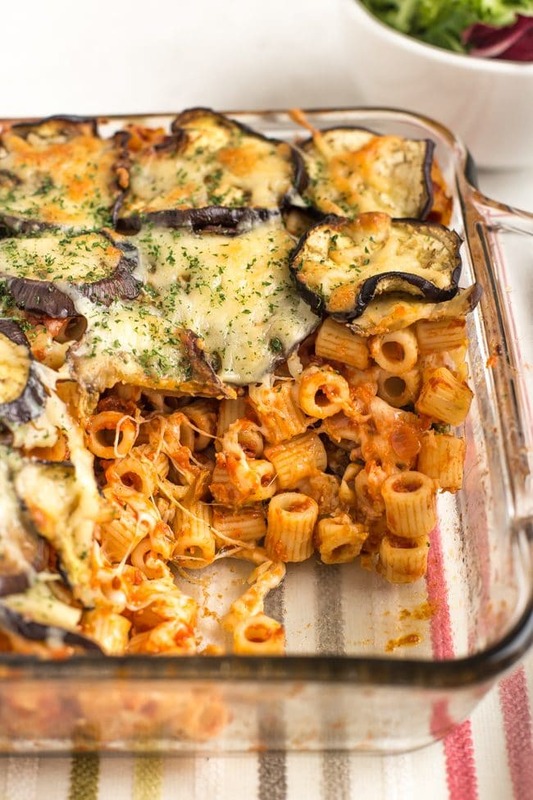 A hearty, cheesy pasta bake inspired by my favourite eggplant parmesan! 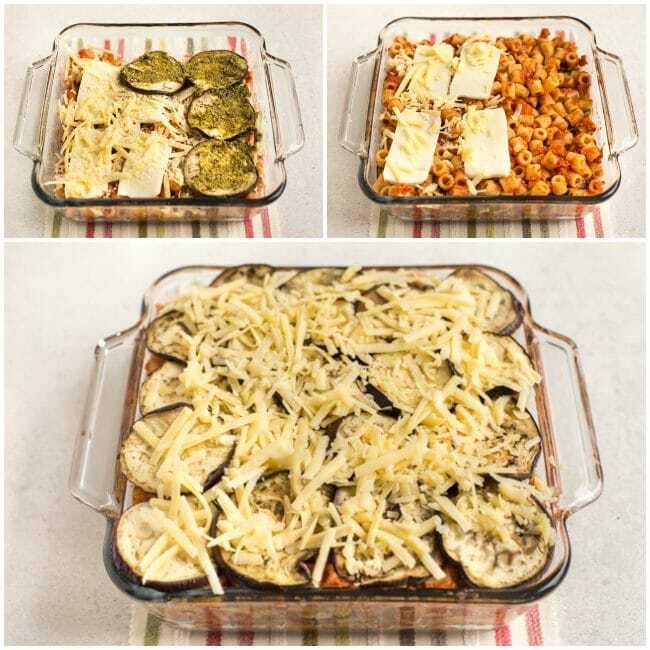 A hearty version of the classic Italian dish melanzane alla parmigiana, this eggplant parmesan pasta bake is made with three different cheeses to make for an irresistible dinner. Melanzane alla parmigiana / eggplant parmesan is one of my favourite dishes of all time – aubergine (eggplant), tomato and cheese is a classic combination of ingredients that never fails. But me being me, I do sometimes crave something a bit carby to go with it, and while serving some crusty bread on the side is always a winner, this time I thought I’d turn it into a cheesy pasta bake instead. 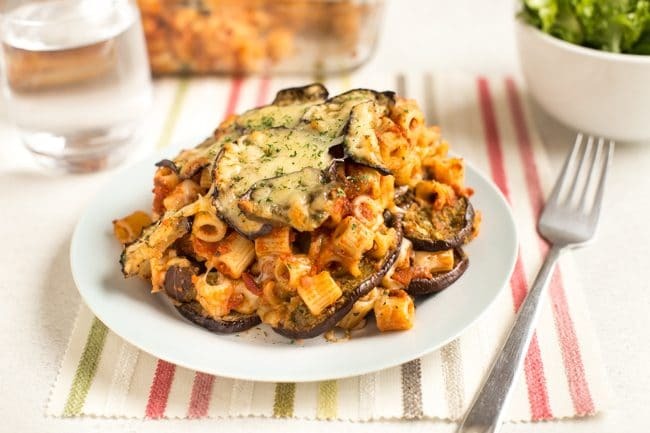 This eggplant parmesan pasta bake is a rich and hearty dinner made with three cheeses – it’s totally irresistible (can you marry a pasta bake?). In the UK, we call eggplant ‘aubergine’, but for some reason it’s always ‘eggplant parmesan’ to me. ‘Aubergine parmesan’ just doesn’t have quite the same ring to it. But whatever you call it, it’s the best. And I also added pasta! Because pasta is always welcome on my plate. 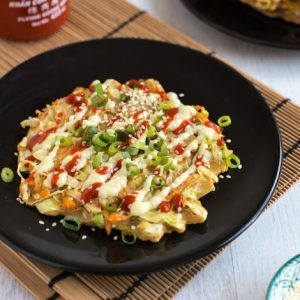 There’s no one correct way of making eggplant parmesan, and different parts of the world have developed their own versions. 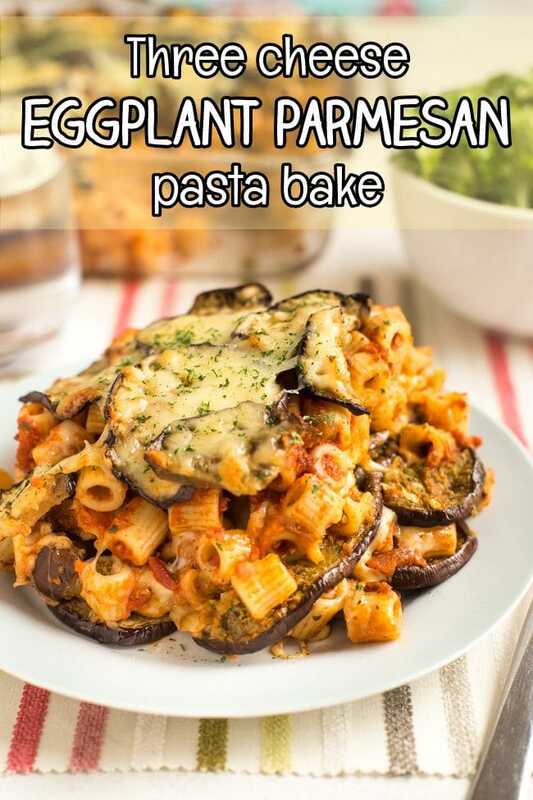 I’m never a stickler for authenticity (food is meant to be explored; I don’t see the point in sticking to the rules), so this eggplant parmesan pasta bake is my own, carby take on one of my favourite dishes on the planet. Do I need to salt my aubergine / eggplant? Lots of old-fashioned recipes call for you to thinly slice and salt your aubergines before you cook with them – supposedly this helps to reduce their bitterness. 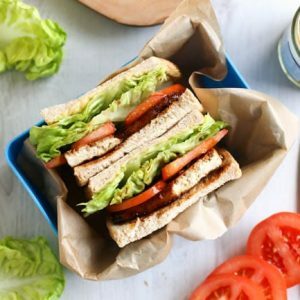 But most people now agree that it’s not really necessary these days – modern aubergines are generally not that bitter in the first place. I’ve cooked with aubergine hundreds of times, and I never salt it. It’s still one of my favourite vegetables. So save yourself the effort and don’t bother! For this pasta bake, all you need to do is slice the aubergine, and it’s ready to use. 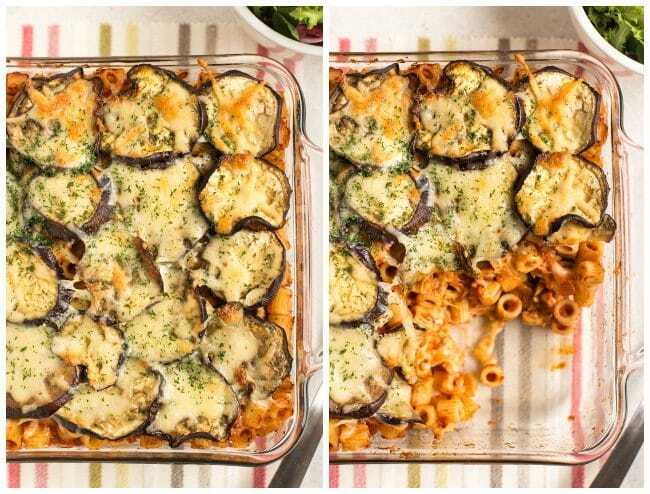 You do need to pre-cook the slices of aubergine before you can add them to the pasta bake – I just popped them under the grill (broiler) for a few minutes on each side. This makes them beautifully soft and squidgy, rather than hard and chewy, and also it will stop them from making your pasta bake too watery. 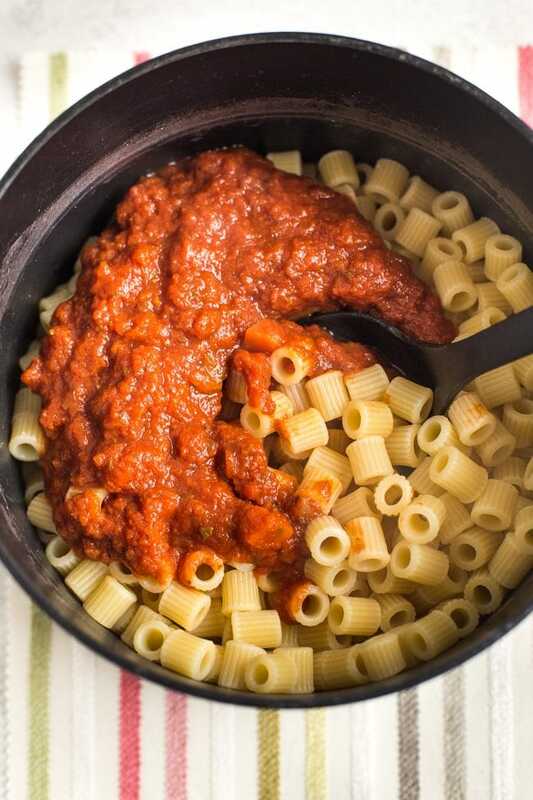 On this occasion, I didn’t make my own homemade tomato sauce – I used a jarred sauce. I often make my own, but this is meant to be a simple vegetarian recipe after all, and after grilling the aubergine, cooking the pasta, and preparing the three different cheeses, I decided that homemade sauce would be one step too far. Of course, you’re free to use a homemade tomato sauce if you prefer! Or, if you want to follow in my footsteps and use a jar of sauce, make sure you choose a good quality brand – you want something nice and rich and flavourful, nothing watery! Once you’ve chosen your sauce and mixed it through your pasta, just start layering with the cooked aubergine, basil pesto, mozzarella, cheddar, and parmesan cheese. In short, no it’s not. Real parmesan is made with rennet (I won’t tell you what that is here, but click the link if you want to know), so it’s not vegetarian. 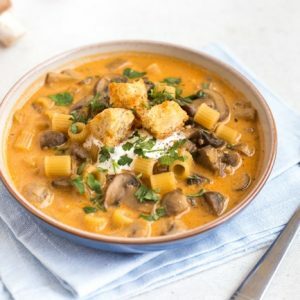 However, there are plenty of vegetarian parmesan-style cheeses around – any kind of hard Italian cheese will do, just check the ingredients list to make sure it’s veggie. And wherever you see me say ‘parmesan’, imagine me saying ‘vegetarian parmesan-style cheese’ instead. 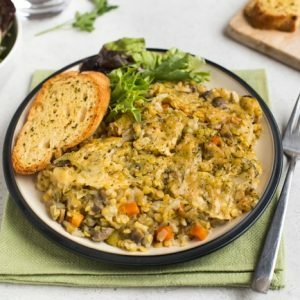 In the UK, the cheapest supermarket own brand ‘Italian hard cheese’ is usually vegetarian – so as an added bonus, you can save money buying veggie too! 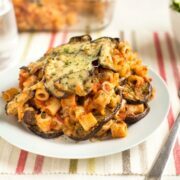 The end result is a comforting pasta bake that is sure to please any aubergine lovers! 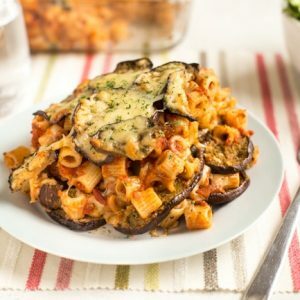 Since it’s got a few different layers of cheese through the middle, you end up with little pockets of gooeyness, along with those soft slices of melt-in-your-mouth aubergine, rich tomatoey pasta, and herby pesto. It’s truly wonderful. The recipe makes 4 good-sized portions, so we quite happily ate this for two nights running. You could also easily double it up if you need to feed a crowd! Cut the aubergine (eggplant) into thin slices. 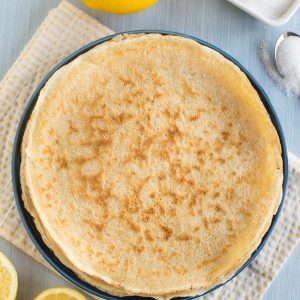 Aim for each to be around 4-5mm thick, but it doesn't matter too much - just try to get the slices fairly even so they cook at the same rate. 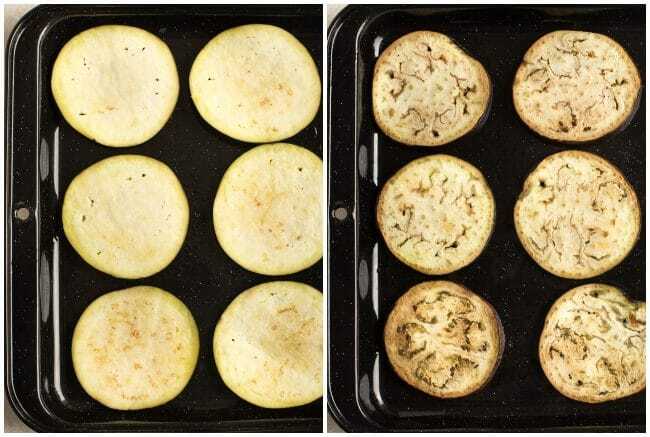 Lightly spray a baking tray with oil, and lay out the aubergine slices in a single layer. Cook under the grill (broiler) on a medium heat for 2-3 minutes each side, until soft (but ideally not yet crispy). You may need to cook the aubergine in 2 or 3 batches if the slices won't all fit on one baking tray. Boil the pasta in plenty of water until cooked al dente, then drain. Mix the tomato sauce with the pasta. I repeated this sequence twice, then finished with the remaining pasta, aubergine slices, and cheddar cheese. Bake at 190°C (Gas Mark 5 / 375°F) for around 25 minutes, or until the pasta bake is piping hot throughout, and the cheese on top is crisped up to your liking. I used 'pizza mozzarella' (which comes in a block) rather than fresh mozzarella (which comes in a ball, in water). Pizza mozzarella is less wet, so you'll end up with a richer, less watery pasta bake. You can use fresh mozzarella if that's all you can get, but it may end up a little wetter. Grated mozzarella would also be fine! 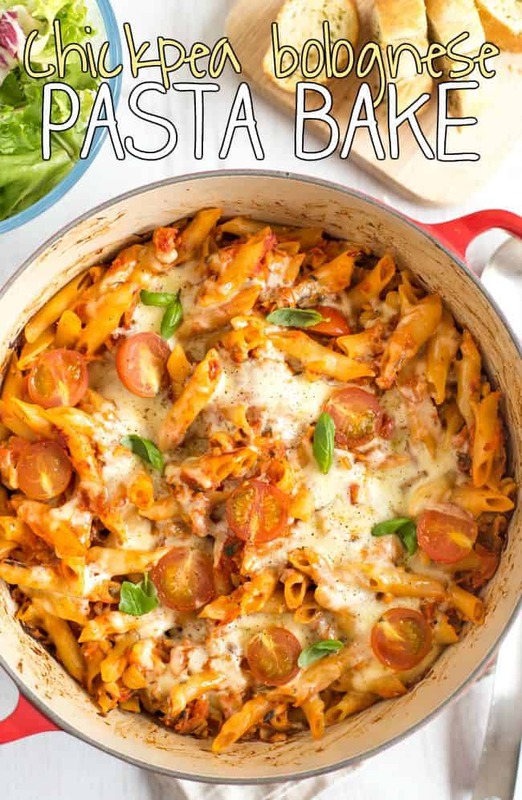 Love a good pasta bake? Try my cheesy chickpea bolognese pasta bake, made with chickpea ‘mince’! I have never tried such dish. Gingerly I cooked it as per the instructions. It was very delicious. My Son loved it too much. Will cook again. Bookmarking this recipe. Sure, I don’t see why not! I’m intrigued though, don’t all pasta shapes taste the same? 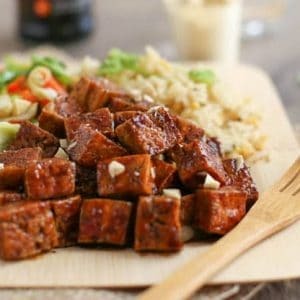 Hi, This is a nice recipe. I’ve already tried this one but had faced a problem. The cheese on top is not crisping up. Am I doing anything wrong? Hmm that’s strange! Cheese should definitely crisp up if you bake it for long enough. In this recipe everything is already cooked so you’re really just baking it to get the cheese to melt and crisp up on top – so maybe just try turning the oven up a little or leaving it a bit longer? Oh my! This is good food!